True love never dies. It is redefined every time you feel it. When Nish falls in love, little does he know the impact it is going to have on his life. Hailing from conservative backgrounds, love is nothing less than war with the world for the lover and his beloved. Albeit limited communication, they still dare to dream of a life together. But with the pressure of attaining stability in life, he finds it impossible to chase his dreams endlessly. An unassuming man from a modest background, he fights helplessness and challenges thrown at him by life, only to learn precious life lessons. His faith in God gives him the strength to move on and find his calling in writing and poetry. When Love Happens… is a tale of shattered dreams and redemption, of fear and fortitude and above all, of the indomitable human will. 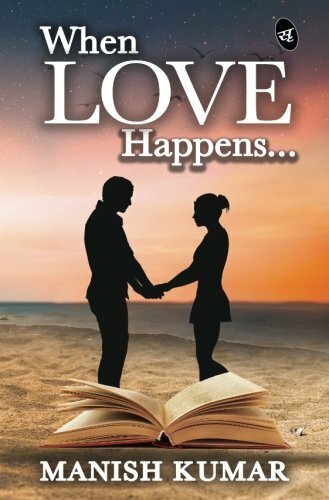 “When Love Happens” by Manish Kumar revolves around the story of the protagonist Nish, who struggles to maintain balance between his dreams and his love life. This book gives a deep insight on how the faith of a person has the ability to change his life. The book engross the readers with it till the end with its twist, but at times the narration makes it boring. It also deals with every emotions a person undergoes like friendship, love, desire for dreams, faith, etc. The shayari beautify the book more. Though the title emphasise that this a romance fiction, this book also deals with the hardships every adult undergoes in his early twenties. The author has used lucid language and simple words which comforts the reading. The cover could have been better to gather more attention of the readers and the blurb gives an insight about the book.